CITIES IMAGINED symbolizes the dynamic relationship between real and imagined spaces, subjects, and objects across disciplines. Forged from lifetimes of academic work that balanced critical insight with constant creativity, Julian Chambliss and Walter Greason document, analyze, and synthesize multiple traditions of critical analysis and aesthetic performance. In tracing the history of culture, identity, and structures over the twentieth century, CITIES IMAGINED provides a framework to rethink modern history. 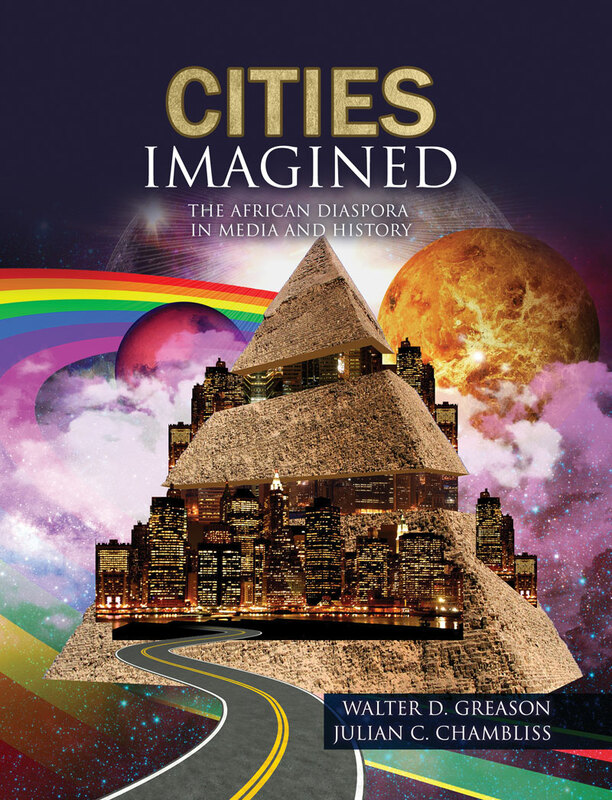 From the emergence of the Booker T. Washington’s “Tuskegee Universe” in the late nineteenth century through the trans-dimensional character of the comic book city and transpatial power of the Black Lives Matter moment, CITIES IMAGINED offers a sequence of templates that will guide scholars, activists, architects, and theorists through processes of metropolitan creation in pursuit of equal justice for all people. Chambliss and Greason move their readers from the dreams of Booker T. Washington, Anna Julia Cooper, and Martin Luther King, Jr. through the recognition of Barack Obama, Kamala Harris, and Sonia Sotomayor as shapers of an uncharted future. How do dreams become real? The examination of spatial change though both literature and history provides a furnace and an anvil for the creation of Audre Lorde’s new tools. CITIES IMAGINED is the hammer we all need. Dr. Greason's research focuses on the comparative, economic analysis of slavery, industrialization, and suburbanization. He serves as the Treasurer for the Society for American City and Regional Planning History, which is holding its national conference this year in Cleveland, Ohio, from October 26 through 29, 2017. With a variety of co-editors, Dr. Greason has published Planning Future Cities (2017) - an innovative look at architecture, urbanism, and municipal design - as well as The American Economy (2016) - a provocative examination of race, property, and wealth in the United States since 1750. His scholarly monograph, Suburban Erasure , won the Best Work of Non-Fiction award from the New Jersey Studies Academic Alliance in 2014. He also won grants from the Mellon Foundation (2011) and the National Endowment for the Humanities (2016). His recent online resource, the Racial Violence Syllabus, attracted worldwide attention at the peak of the controversy surrounding the "Unite the Right" rally at the University of Virginia in Charlottesville, Virginia. Translated into seven languages, it reached more than 4 million direct users and drove the public debate surrounding the removal of Confederate memorials across the United States in venues as varied as National Public Radio, The Atlantic magazine, and The Chronicle of Higher Education. Julian C. Chambliss explores the real and imagined city. From urbanization and planning to comics and popular culture, his research, teaching, and writing explore how perceptions shape policy and action creating our collective urban experience. Like most Floridians, Julian was not born in the state. His true origin remains shrouded in mystery. We know that his quiet demeanor and glowing character guided him through childhood. Once freed from high school, he embarked on an undergraduate education at Jacksonville University highlighted by an early inability to pick a major. After some trial and error, he discovered that history was both stimulating and enlightening through his experiences in the Ronald E. McNair Post Baccalaureate Program. Having completed his undergraduate work with honors in history he went on the University of Florida. Immediately he decided that urban history was the only logical course for historical study and focused his attention on policy formation, culture, regionalism, and civic infrastructure issues. His research evolved to focus on urban development and culture in U.S. cities. Dr. Chambliss is Professor of History at Rollins College in Winter Park, FL. He teaches courses in urban history, African-American history, and comic book history in the United States. As a teacher-scholar concerned with community and identity, he has designed numerous public digital history projects that trace community development, document diverse experience, and explore the cultural complexity in Central Florida. He has been recognized for his community engagement work with a Cornell Distinguished Service Award (2014-2015) and Florida Campus Compact Service Learning Faculty Award (2011). Chambliss is one of the producers of "Every Tongue Got To Confess," a podcast exploring the experiences and stories of communities of color. Dr. Chambliss serves as coordinator of the Africa and African-American Studies Program at Rollins, and Coordinator of theMedia, Arts, and Culture Special Interest Section for the Florida Conference of Historians.